MBPC’s work cannot be done in a vacuum. We collaborate closely with allied organizations to identify what research is needed and educate policymakers about what the research shows. 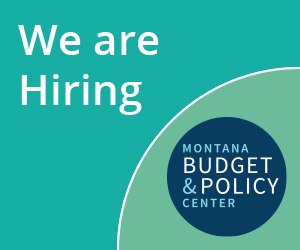 Partnership for Montana’s Future is a coalition of advocates and groups who share a common belief that Montana’s future depends on wise investments in education, infrastructure, and safe and healthy communities. The coalition has over 50 organizational members representing low-income advocates, Indian Country, women’s rights organizations, labor, and conservation. Partnership members have played a critical role, both in communities and in the Capitol, in advancing public policy. It rallied thousands of Montanans to participate in budget and tax debates, and through our Legislative Summits, we have trained hundreds on how to effectively communicate with the press and policymakers on tax and budget issues. Healthy Montana is coalition of organizations dedicated to the reauthorization Medicaid expansion that has provided one in ten Montanans with access to affordable health care. Time for Montana is a coalition of organizations dedicated to passing paid family and medical leave legislation in Montana. At some point, nearly everyone faces a moment when they need leave, whether it’s to bond with a new baby, care for an aging parent, or recover from an illness. Paid leave – including family leave, parental leave, and medical leave – replaces a portion of an employee’s wages during leave and gives them the peace of mind of being able to still make ends meet while caring for a loved one. State Priorities Partnership a national network of organizations that use evidence and analysis to advance policies that give more people the opportunity to prosper. They do this by equipping lawmakers, journalists, advocacy organizations, nonprofit service providers, and the public with information that helps children get a quality education, families get medical care, and working people get the assistance they need to build a better life. Economic Analysis and Research Network is a national network of more than 60 state and local research, policy, and public engagement organizations that advance policies to raise wages, boost availability of and access to jobs, enhance job quality and stability, improve retirement security, and reduce income inequality.